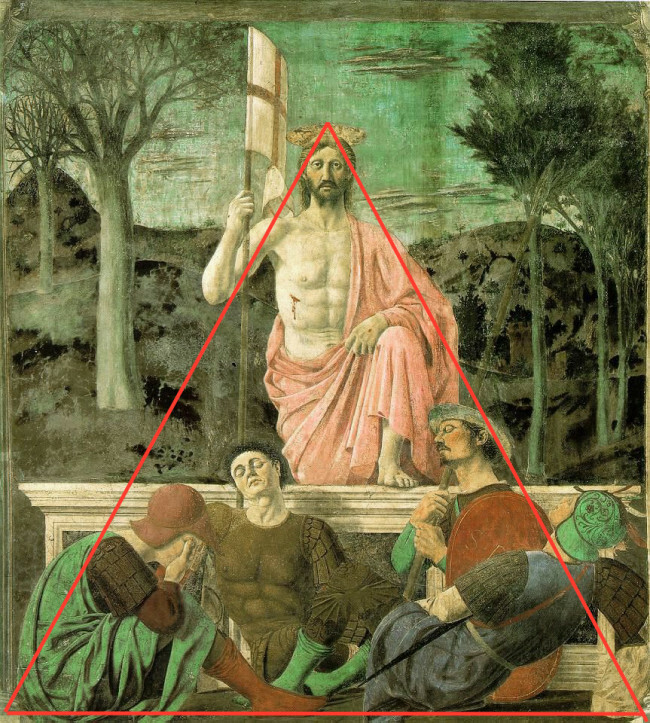 Last week we looked at Piero della Francesca’s painting-by-numbers approach to composition. 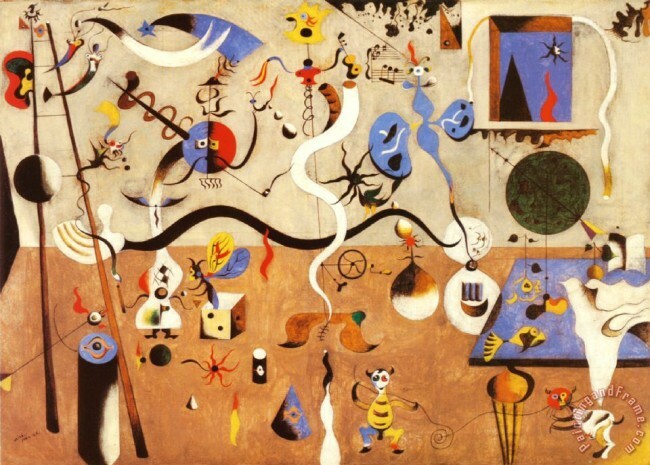 This week we’re going wacky with Surrealist composition which proposes a different way of building up a picture. Our art starter is Giorgio de Chirico (1888-1978) a Greek-Italian painter. 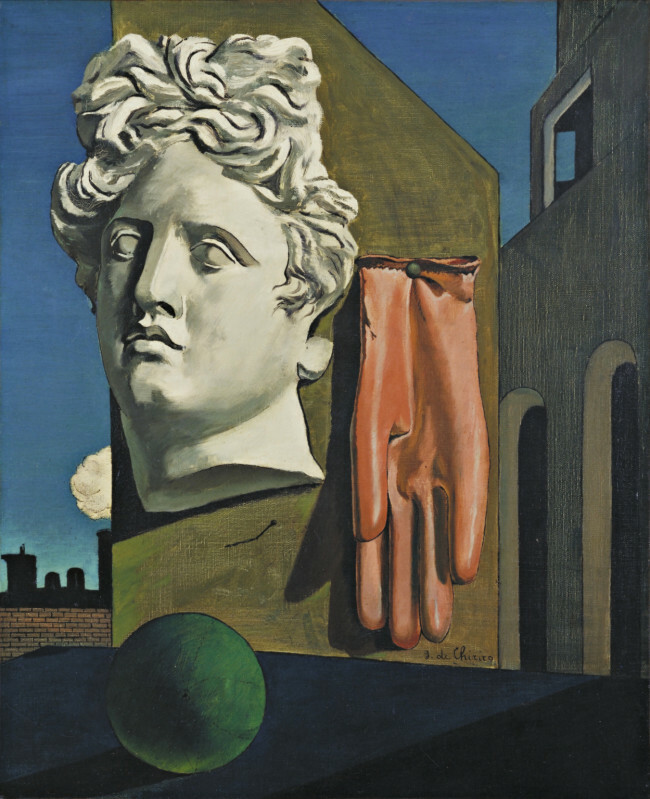 Although not a signed-up member of the Surrealist group, de Chirico is good person to help us get to grips with how Surrealists composed pictures. The Song of Love (1914) is among de Chirico’s famous paintings. Weird as it is, it may look familiar… that’s how embedded his oddball vision is in our collective cultural psyche. Let’s unpack this picture. The architecture on the right recalls something mediterranean. On the left there’s what could be a smoking rooftops or a puffing train. An angled wall in the centre separates the space and a huge Greek-style bust floats before it. A red shiny glove is pinned to the wall while a green ball lies on the dark floor. There appears to be a fore, middle and background but other than that this comes across as a collage of disparate bits and bobs blended into a single scene. De Chirico has put together this painting in a new way. He knew the French poet Guillaume Apollinaire and was familiar with his theory of ‘random plasticity’ according to which things come about by accident and are then placed in a certain way to express an idea. Though The Song of Love is an assemblage of strange juxtapositions, the composition is made to look cohesive and deliberate through careful use of colour, shape, line and light. It “works” though in reality it should not. More than that we sense it’s communicating a meaning. 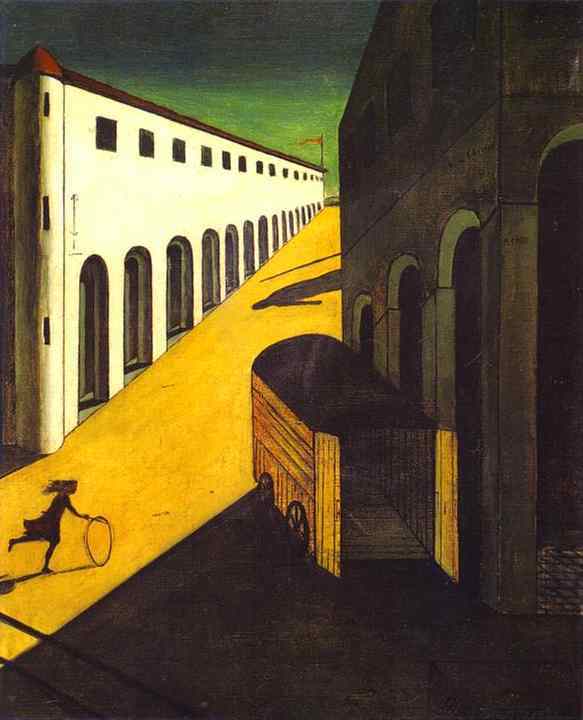 The same sort of thing is happening here: The Mystery and Melancholy of a Street was also painted by de Chirico in 1914. Salvador Dalí (1904-1989) is the main man of the Surrealist movement and no one knows better than him how to go to the cinema of dreams, pick unrelated things and then mix them together. Free compositions that he believed would revolutionise modern life. 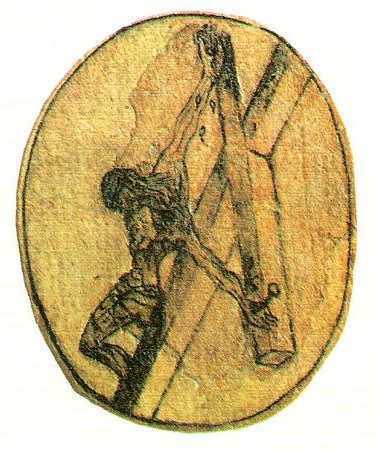 Dalí said this vertiginous Christ of St John of the Cross (1951) came to him in a dream though it also relates to a drawing by the Spanish friar St John around 1575. Dalí’s angle on Christ on the cross is so unlike what we’re used to. Painful, pendulous. Unsettling are the dark sky and vapours underfoot, the water, the boat and fishermen. Here we have a Surrealist magpie, selecting things (from a dream so he says) that catch his eye, before putting them in a hot-potch creative nest. Things that don’t belong together are being made to relate in an illusionistic mirage. Again it works, though in a parallel universe. And in all the oddness, is this Surrealist artist using tricks we saw our Renaissance master use last week? Tricks for imparting some visual cohesion and spiritual meaning? 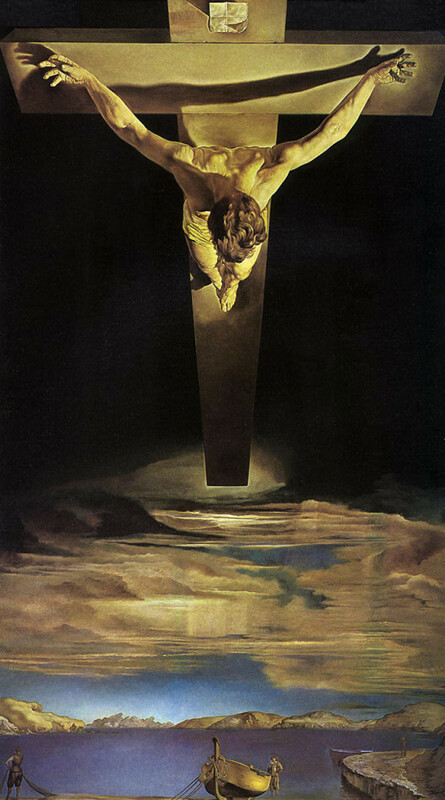 If Piero uses composition to make Christ real, then Dalí uses it to blow our minds.